With less than one week to go for NAB Show, VSN is ready to blow your mind with its latest innovations! Starting on Monday April 8th until Thursday April 11th, professionals of the company will offer at booth SL7606 the best advice and present the latest technology of the broadcast and media sector. But if you still have doubts about whether you should visit VSN in Las Vegas, here you have the top 5 reasons to convince you. Nowadays, competitiveness within Broadcast and Media industries has grown to a point where every second is paramount in content creation and production. The bloom of new screen-types and devices has brought along the need to manage an increasing amount of video files. In addition, the rise of different formats and the distribution of content aimed at different platforms, creates a complex environment that makes it necessary for audiovisual companies to automate repetitive tasks as much as possible in order to increase efficiency and avoid mistakes. VSNExplorer MAM, the company’s Media Asset Management software, offers all the tools necessary to manage the media of a company or a group of companies, from its ingest to its delivery, so that professionals in this creative industry can focus on what they do best: creating. Furthermore, correctly cataloging assets and automatic metadata detection tools are crucial for a company which main activity involves managing big amounts of audiovisual content. For this purpose, VSNExplorer MAM is integrated with Artificial Intelligence systems, and in fact, at NAB we will show our latest integration of the VSNExplorer MAM with a private Artificial Intelligence system on-premise, which provides more accurate, safe and representative data results due to being a system you own and can train. For the first time, MOS open standards-based VSN NewsConnect, will allow journalists to create content without restrictions from a single workspace. In essence, with this add-on for the VSNExplorer platform you can plug it all: NRCS, CG, NLE, studio playout systems and videoservers, among others, within one, intuitive, centralized workspace to create a seamless workflow for news production. Following the theme of automation that we mentioned when discussing the VSNExplorer MAM, VSN’s Media Exchange solution takes automation to the next level, eliminating your dependence on manual tasks and completely automating and centralizing all the communications and management of workflows in a more efficient way. It is designed for environments in which media content of all types – including news, sports, advertising, programs, films and TV series – need to be exchanged, managed and available to more than one location. In a way, it acts like a content hub that can be hosted either in the cloud or on-premise. The latest version of our VSNCrea, the HTML5 traffic and scheduling system, is here and is available as cloud-based, hosted on-premise or via a SaaS model. Also now, apart from enabling the management of a company’s content production catalog, its advertising, production workflows, programming, playlists, running order and broadcast planning, it is compatible with a broad range of MCR automation systems and EPG standards, and is both multi-language and multi-regional. Moreover, VSNCrea is now a multitenant system, meaning that a single instance of the software can serve multiple clients or organizations, allowing for greater saving of costs. 5. Live demos and professional advice never stop at our stand! 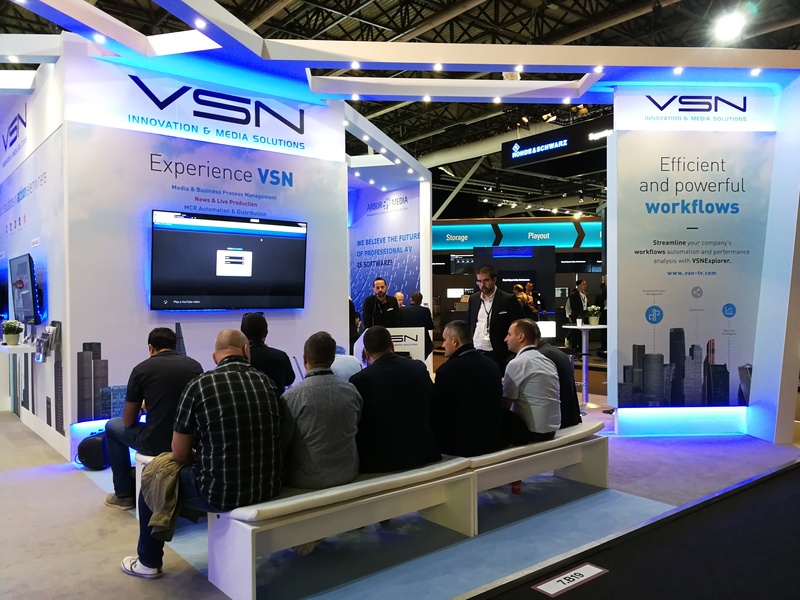 Take advantage of the VSN experience and come by our booth, which has been designed to allow the performance of demos of all the solutions of the company, as well as to enable several visitors to receive advice from the different departments of the company in its different spaces. Those interested in discovering more about VSN’s products and solutions can visit VSN’s booth (SL7606) at NAB (8-11 April, Las Vegas Convention Center) or book a demonstration in advance via the VSN website.